Two directory traversal vulnerabilities have been found in Rhythm Software File Manager and File Manager HD. When exploited, these vulnerabilities allow an anonymous attacker to write files to arbitrary locations within the SD card of the user's Android device. This advisory discloses two directory traversal vulnerabilities in Rhythm Software File Manager and File Manager HD. When exploited, these vulnerabilities allow an anonymous attacker to write files to arbitrary locations within the SD card of the user's Android device. By tricking a user to download a directory from a malicious FTP server that contains files with fowward-slash directory traversal sequences in their filenames, it is possible for the attacker to write files to arbitrary locations within the SD card of the user's Android device. When extacting compressed files from a ZIP archive, the ZIP extraction functionality does not properly sanitise compressed files that have directory traversal sequences in their filenames. By tricking a user to extract a specially crafted ZIP archiving containing files with directory traversal sequences in their filenames, an attacker can potentially write files to arbitrary locations within the SD card of the user's Android device. An attacker can potentially leverage either of these vulnerabilities to overwrite files in known locations within the SD card in the user's Android device. The instructions below illustrates how this vulnerability can be reproduced using File Manager HD. The steps for reproducing the vulnerability on File Manager are very similar, and hence, will not be repeated. On a Windows system, unzip the POC file into a directory. This gives FileManagerHDPOC.exe. FileManagerHDPOC-forward.exe is a POC FTP server that will send filenames with forward-slash directory traversal characters in response to LIST commands. Go to the Windows command prompt and run FileManagerHDPOC.exe on a system. It will listen on FTP Port 2121. IMPORTANT: Ensure that the FTP-client in File Manager HD is configured to use Passive mode. The POC FTP server only supports Passive mode. 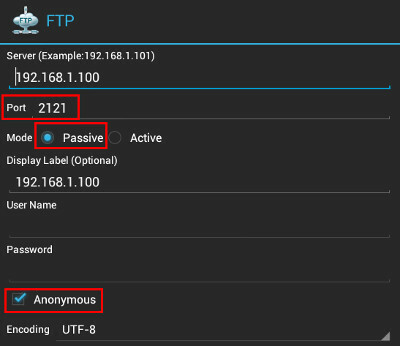 Configure the FTP-client in File Manager HD on an Android device and use it to connect to the POC FTP server. You can use any username/password. 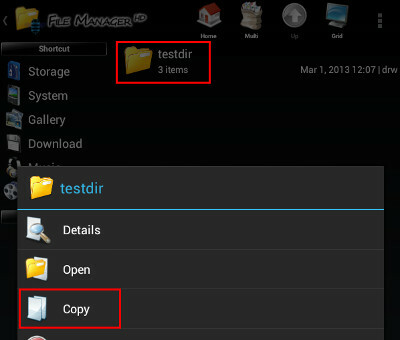 Now, proceed to copy the entire /testdir directory from the POC FTP server into the Download folder of the Android device. i.e. /mnt/sdcard/Downloads. When the download completes you'll notice that testfile2.txt will be written into /mnt/sdcard/DCIM/testfile2.txt instead of into /mnt/sdcard/Download/testdir/testfile2.txt. Follow the steps above and make sure that you have copied the entire /testdir directory from the POC FTP server into the Download folder of the Android device. Extract testzip.zip and choose "Extract To This Directory"
When the extraction completes you'll notice that zipPOC.txt will be extracted into /mnt/sdcard/DCIM/zipPOC.txt instead of into /mnt/sdcard/Download/testdir/zipPOC.txt. Avoid downloading files/directories from untrusted FTP servers or extracting untrusted archives. 2013-05-19 - Initial Vendor Notification. 2013-05-20 - Vulnerability Details Sent to Vendor. 2013-05-22 - Asked Vendor for Release Date of Fixed Version. 2013-05-26 - Vendor replied that vulnerability will be fixed in future releases.